Often, the people that didn’t fit into the cost-driven strategy were swiftly replaced. Today, this is no longer the case. Businesses recognize that they are comprised of, and run by, people. In the end, the future of business lies in treating employees as humans who have their own needs, desires, purpose, and values. In the midst of the Fourth Industrial Revolution undergoing exponential technological growth, it remains imperative to recognize the value of human relationships. Ultimately, it’s these very relationships that will drive the future of business. Recognizing this drastic shift caused by the technological advances occurring before our eyes, we must not lose sight of the value of humans and the unique role that only we can play. Importantly, we search for guidance in our human role by first understanding the Major Market Forces influencing this shift towards the rise of the people platform. The Age of the Customer: With the power of social networks, customers have significant influence over price, brand, and the set expectations of their engagement with any organization. The Mobile Mind Shift: Organizations know the power of reaching their audience/customer base via mobile phones and have shifted their focus there. Cloud/SaaS Offerings: Complete systems are being used for day-to-day functions performed in the cloud. In the early days of software packages, a company may have held entire storage closets filled with software and their bulky training manuals. Now, with software as a service (SaaS), businesses readily outsource their software needs and the subscription is often accompanied by significant storage in the cloud. The Internet of Things: The scope of the available tools that you can find on the internet, many of them being tech-driven devices, raises new privacy and security concerns. With the rise of AI, and the unknown long-term impact it will have on our society and how we conduct business, relationships have become our most powerful asset. Increasingly, businesses are stressing the importance of employee soft skills and emotional intelligence, serving as a counterbalance for the overwhelming trend of rapid technological growth. Ultimately, emotionally intelligent employees who can build, sustain, and drive relationships will influence and lead the future of organizations. Moreover, the role of HR is gaining more responsibility in long-term strategy, by focusing on relationships. After a recent summit meeting between HR leaders and Boston Consulting Group, they reached a powerful conclusion on the future of the people platform. At the forefront of the Rise of the People Platform lies Be Human–a core value of the business relationship management (BRM) philosophy. Through this belief, BRMs celebrate failure as an opportunity for growth, which creates a conducive business environment for us to cherish our humanity. Additionally, the call to not sacrifice happiness (our own or another’s) for the sake of business or technological advances is woven into the Core Values Statement of BRM Institute. 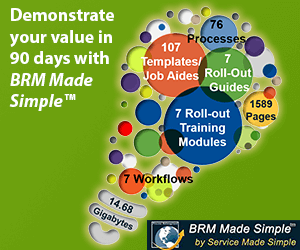 BRM Institute addresses the need for a balance between people and rising technological advances by providing comprehensive training that teaches organizations to recognize and promote value through relationships and to foster a company culture of shared ownership. This people-driven mindset sets aside traditional departmental “silos” (HR, IT, C-suite, etc.) in order to focus on building and fostering relationships to satisfy individual and organizational purpose. When reflecting on how humankind will address the rapid technological advances as well as the rise of the people platform, Klaus Schwab puts it eloquently and decidedly.